When introducing an intranet, there are often fundamental misunderstandings with the members of the employee representatives (sometimes known as the works council, workers' council or staff reps). Often there are differences between the perceived interests of employees and their actual interests. This post is intended to remedy some of the common misunderstandings, and provide the employee representative group with useful tips for involvement in an intranet project. One concern raised by many employee representative groups, is that an intranet will be (mis)used as a performance measurement tool. For this reason, it is understandable that their next request will be to allow employees to anonymously work in the intranet, and anonymously access the contents of the intranet. Of course, this is possible - but it may actually get in the way of employee engagement. Our experience shows that with most intranet projects, employees are often only willing to contribute to an intranet when they have their own username. Activity within the intranet increases when these actions can be attributed to specific users. This is only logical: Employees want to be recognized for the high quality content they edit or contribute. That is only possible when the content is personalized. In order to calm the performance measurement fears, a company can configure the intranet to not allow statistical evaluation at a user level, so that performance comparisons can not be made, that you can not see who has contributed to how much of the content. One fear comes from that all changes in the wiki can be tracked. But this fear is unfounded. Intranets are designed to show who made what changes to which document - with an emphasis on document. In practice, you can't determine who made what changes within the intranet, but only in a specific document or page in the intranet. Intranet-wide changes by a user can not be systematically seen. A document or page specific revision history is maintained, and you can see if a specific change is meaningful. This can be criticized in theory, but performance monitoring is not possible in reality, and thus the fear that an employee's every step will be monitored is completely unfounded. An intranet offers the employee representative group an excellent opportunity to become central to the company's intranet by providing accessible, relevant and up-to-date information. In fact, most employee representatives use their intranet intensively. Through this, employees have more input into the intranet and can actively influence processes. The so-called top-down approach used by many companies is not replaced with a bottom-up approach, but instead with a communication cycle. For this reason, the employee representative group should be committed to an early integration of an intranet project, to positively influence and develop an improved internal company communication approach. Certainly, an intranet may pose problems for employee rights. Intranets are often used for business intelligence purposes, therefore personal data and statistics are collected within the intranet and protected by an access permission structure. The permission scheme must be correctly designed and implemented, so that no sensitive data can be viewed by unauthorized personnel. An experienced intranet company, such as //SEIBERT/MEDIA, can provide support and ensure compliance with your strict data protection requirements. Management often has great interest in driving an intranet project, or else it wouldn't introduce one. However, sometimes, an intranet project lacks the "strong backing from the top", and is introduced in a department which then encourages a wider-scale rollout - the usefulness is often questioned by management. In the first case, the employee representative group is in the position to make demands, and put certification and support on the negotiating table (just as with any other widely-used software product). But the representatives should take care: Are the advantages and disadvantages evident and understood? They have the opportunity to evaluate the system before its introduction, to be kept in the loop, and to even hold the system as a hostage to collective bargaining. In the second case - when management is not convinced of an intranet's usefulness - the representatives should be aware of their responsibility. If they don't support the adoption of the intranet, they not only scuttle the project and alienate the employees who already find it a useful tool, but also shoot themselves in the foot and deprive themselves of the opportunity and advantages to use the intranet themselves. If the employee representative group opposes the project, then there most likely will be no intranet. An intranet is a helpful tool that empowers employees, and therefore, it is in the best interests of the employee representative group to support it. The introduction of an intranet has a political dimension, and can be used as a tactical tool. The employee representative group should therefore be aware of its power and responsibility, and act both moderately and far-sighted. 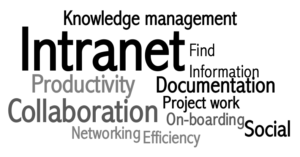 Provide proactive engagement for the intranet project. Establish an area within the intranet for the employee representatives to distribute their own information. Consider using actual usernames - it is in the interest of employees and encourages employee recognition. Use the wide-spread adoption of the intranet as a tactical tool. Support the intranet from a systematic point of view because it empowers employees. Do you have questions about introducing an intranet, or do you need support with an existing project? Are you a member of the employee representative group? Or are you part of the management team? We are experts in both corporate communications and intranets and would love to help, please don't hesitate to contact us! Lesen Sie diesen Artikel auf Deutsch.